The subject of the March 17th BBC4 radio program, In Our Time, was medieval universities. In the 11th and 12th centuries a new type of institution started to appear in the major cities of Europe. 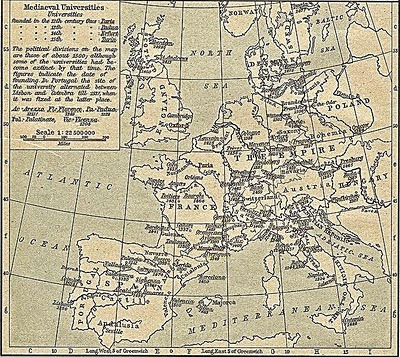 The first universities were those of Bologna and Paris; within a hundred years similar educational organisations were springing up all over the continent. The first universities based their studies on the liberal arts curriculum, a mix of seven separate disciplines derived from the educational theories of Ancient Greece. The universities provided training for those intending to embark on careers in the Church, the law and education. They provided a new focus for intellectual life in Europe, and exerted a significant influence on society around them. And the university model proved so robust that many of these institutions and their medieval innovations still exist today. Before universities, education was provided by monastic schools. But population growth and increasing urbanization in Europe led to the increase in demand for a more sophisticated, professional theology, law and medicine, and the response was the institutionalization of these subjects in universities something that has not changed in 1000 years. Standards were set for degrees, and degrees became sought after marks of erudition, though perhaps with a dual purpose. Before universities, students competed with their teachers for their teacher's students, while after universities were established, students instead began to compete amongst each other for jobs. This was because masters could control their students by refusing to grant their degree if they were misbehaving. 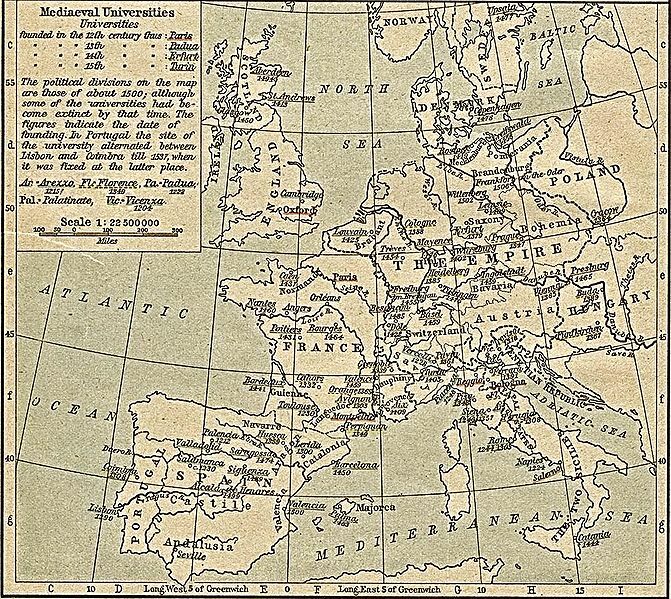 The first universities were international -- people came from all over Christendom, particularly Paris because there, schools were supported by competing ecclesiastical authorities. The freedom for the student or teacher to move to another school if he fell out with one was attractive. And, in a city like Paris, the infrastructure was conducive to being a student, because of the ease with which students could find living quarters or jobs. Teaching in the early universities was entirely in Latin and students all first had common grounding in the arts, and this meant that specialists could keep talking to each other in a common language with a common eductional foundation even after their scholarly paths diverged. In fact, students would follow the same course for their first several years in any of the early 6 or 7 universities. Information came from very old texts. Geometry went back to Euclid, music back to harmonies discussed by Greeks, philosophy was all Aristotle. The result was that students all spoke the same language. Even the early universities were very expensive -- either wealthy families paid, or the Church paid, or students worked. Universities were originally simply rented rooms, and could be nomadic -- if things went poorly in one city, the university could move. Cambridge, for example, was founded by a migration from Oxford. And, perhaps with online universities we are reviving the model of universities without a fixed home as now a student can pick and choose his or her courses from all over the world. University infrastructure developed over time. The British model of colleges and residential halls gave students more opportunities to study, and served in some senses to tame students, who were all male, and who came to school at age 14 or 15 with things other than books on their minds. Living in college, with a master who was also a moral tutor, meant that these boys led somewhat less raucous lives than they had when they were free to wander the city. The growth of the monied economy in the 11th and 12th centuries was a crucial factor in the development of universities. A young man couldn't barter a flock of sheep for an education. And, universities generated a degree of social mobility. Poor students could get a scholarship from the local church and become upwardly mobile once he got his education. Also, colleges were set up as charitable foundations, so talented poor students were able to continue their studies. Of course, before the universities as we know them now, there were many schools and very high intellectual achievement in the Islamic caliphates. Before that, there were major institutions of learning such as the libraries like the major one at Alexandria, and even earlier of course were the Academy and Lycaeum of Aristotle and Plato, and presumably many others (that we personally don't know about). And we are writing here only of the western tradition. While modern universities still follow the medieval model to a large extent, what has changed, at least to some extent, particularly in the 'research' universities, is the diminution of the role of teaching to the stress on research at the expense of students (though of course that is de facto, not a formalized role, though we all know its truth). Of course, most research at any given time is not worth much, because great ideas and discoveries come hard, but research has become a bauble of success as universities have become more middle-class and less elite, and as education becomes more vocational than acculturation of the privileged in the narrow skills and talents that were important to their strata of society in medieval times. Eventually, it is likely that there will be a return to education, as research may become too expensive with too little payoff. There may also be a return to the more broad general ('liberal arts') kind of education to replace hyper-focused technical training. But only time will tell how much such change will occur, or when, or what else may happen instead.